It’s holiday season and we have friends coming in town to see our great, over-the-top Christmas Traditions Festival with their 3 wee ones. We are so excited to have them stay with us. 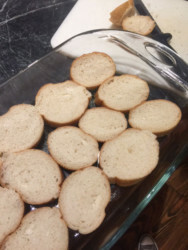 I’m going to make this simple and delicious overnight French Toast for them. I can make 99.9% of it the night prior and I know the kids will love it. I’ll have some sausage links to go along, as well as coffee and juice. 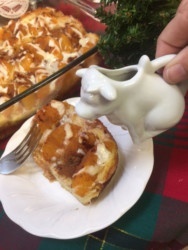 As a special take-home surprise for the children, I have these great little creamers/pourers in different animals. I’m going to put maple syrup in them so they can pour it on their plates of French Toast. I’m going to also let them brew their own tea with our herbal Nutcracker blend and our new Simple Brew pots. It’s so easy to make tea! It will be a great, fun breakfast and the perfect start to a morning of carolers, Santas, hot chestnuts roasting and more! This would be a great treat for a brunch, also! The peaches on top give it ?something special! Come visit us on Main Street and the festival, and make this great breakfast this season! 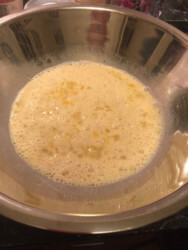 In a large bowl, whisk eggs with milk, salt, sugar and vanilla until blended; pour over bread. 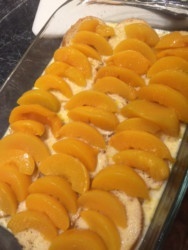 Arrange peaches on top (in a pattern if you like) and sprinkle with brown sugar and cinnamon. Cover tightly and refrigerate for at least 8 hours.